As children, we all visited history museums and gazed up at the ancient bones of a dinosaur rearing towards the sky, fighting off some other ferocious winged being. But was that ferocious winged being, when it was alive, just a bunch of bones too? According to new findings, the pterosaur, Quetzalcoatlus, might not have been able to initiate flight from the ground due to its inability to lift itself off of the ground with its atrophied body. The Quetzalcoatlus was just too weak to be able to lift itself off the ground on its own. In the Late Cretaceous Big Bend National Park of Texas a new dig site has uncovered a set of bones that might change the current view on the flight of pterosaurs like the Quetzaloatlus. By analyzing this new set of bones paleontologist Sankar Chatterjee has determined that the Quetzaloatlus has a wingspan on par with a F-16 fighter jet at the length of 35 meters. Chatterjee also concluded that this flying behemoth was about the size of a giraffe but weighed a measly 155 pounds, that of an average sized man (O’Hanlon). Running this new model through a computer simulation for flight, the Quetzalcoatlus could not achieve flight through the previous thought method of jumping. Its lack of weight in muscle would make it impossible to jump high enough to create clearance for its massive wings. Even if the Quetzalcoatlus was 550 pounds like some suggest, from calculations, even the pole vault method used by bats could only yield a clearance of 2-3 meters (Chatterjee). The pterosaur’s wings would most likely crash against the ground on its down stroke thus injuring the large animal. What is easy for small bats is absolutely impossible for the massive pterosaur. Active flight would even be hard for the Quetzalcoatlus. With such a large weight, its ability to create the power for flapping would be insufficient to keep the animal in the air. From Chatterjees’ calculations the Quetzalcoatlus would need 244o watts to maintain flight after initial liftoff but even excluding the power to get the pterosaur off the ground, the Quetzalcoatlus could only create 1600 watts (Chatterjee). Conference Abstract: “Flight-initiating quadrupedal jumps in the giant pterodantyloid Quetzalcoatlus: fact or fantasy?”, by Sankar Chatterjee, presented at the 2012 meeting of the Geological Society of America, Charlotte, NC. 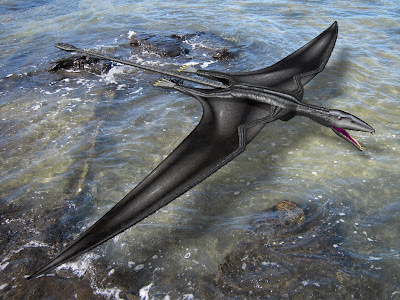 Researcher uncovers more information about rare pterosaur, Texas Tech press release, November 8, 2012. Flying dino too weak to lift off?, Larry O’Hanion for Discovery News, November 8, 2012. I see that you’ve decided to take the position of the “scrawny pterosaur” side. You should still add some text to the effect that this is just one side of the story! It is good to point out that this proposal has been recently presented at a conference (just two weeks ago!) and that it has not passed the full scrutiny of the scientific community.